I think the title gives the game away as to what my next project will be! But, seeing as this year is the 60th anniversary of Buddy Holly's death, building a model of what is supposedly a car that he once owned seems a timely project. I'll say up front that there has been some controversy over the years since this '58 Chevy Impala was found in a junkyard as to whether or not it really was owned by Buddy Holly. But, from what I've seen online, the manufacturer's number etc. seem to tally with the original documentation, so that's good enough for the purposes of this project. The car was extensively restored after years' of neglect, so it's certainly no longer anywhere near original, but I'd like to build my model to represent it as Buddy might have known it. I'll admit straight away that, as well as being new to car modelling, I know next to nothing about vintage American cars! So, please do shout out early if this is a totally unsuitable kit to work with! 1. The full-sized car has covers (skirts?) over the rear wheels. The covers now seem to have the late Peggy Sue Gerron's signature on them (yes - the inspiration for the song "Peggy Sue") - which I'm sure they wouldn't have had originally (unless Buddy wanted a fight with Jerry Allison - the drummer in The Crickets who was Peggy Sue's boyfriend and later husband!). 2. There are aerials to add on the rear wings. There also seems to be a difference in the chrome trim on the front wings, but I'm not sure if that's just a "fudge" from the restoration? The colours seem pretty much certain - Cay Coral & Arctic White. Coral was very fitting for Buddy, because it was the name of his record label. I'll post an in-box review of the kit before starting work, but this build will be a bit of a labour of love for me, because Buddy Holly's music is what inspired me to start playing guitar. So, I'd like to do a decent job if I can, and any help along the way will be very welcome. I don't know the current whereabouts of the car, but if anybody looking in has access to it and can post some detail shots, that would be incredible! Likewise, anyone with knowledge of the '58 Impala in general, any info to help me scratch-build the rear wheel-arch covers and aerials correctly. Plus, once again, please don't be shy to highlight any crucial differences between the full-sized car and the Revell kit that I haven't spotted! Excellent choice Rowan, I am super excited to follow your progress on this one. A beautiful car and a truly legendary back-story (true or not). I will do some digging around for info in my references and see what I can find as well. First up, HERE is a link to a 2010 article where Barrett-Jackson removed the car from auction because it's true heritage could not be adequately proven. HERE is an article after the passing of Peggy Sue Gerron, with a great photo of her with the car. I have a 58 Impala in the stash somewhere, but I don't recall if it has the rear wheel skirts in it. But, although I've got a set of Rustall (which I've never tried...), tackling a junkyard build is something for a long way down the line after I've got a good few clean car builds under my belt. I'm just shooting pics for the in-box review of the kit - and I've got to say I'm pretty impressed. It's got me really looking forward to building the beast. Great choice of subject Rowan. Wonderful idea to tie a story to the build. Assuming this ever was Buddy's car, I've got to admit it's tempting to make a little 1:25 sunburst Stratocaster to sit on the back seat! That would be the logical next build if there's a kit of it? I do love the look most of the 1950s and 60s American cars, so I will look forward to your review and build. I think you might be out of luck on that one, unless there is a resin kit of it somewhere. I'm just thrilled that you're doing what I at least consider Buddy's actual car, as there is an excellent chance as the Barrett Jackson article said that the VIN number could have been changed with a parts change as the pre-restoration shape was most likely almost beyond repair. Holly's Peggy Sue & Dion's Run Around Sue. As for her name on the fender skirts, I willing to bet it's the real deal. If Jerry Allison asked Buddy to change the original name of the song to Peggy Sue to get her back after a break up, just imagine how having her name on Buddy's car would have "Blown" her mind. Just one other thing, the car was lowered by the dealer 3 inches. Not sure why. In any event, I can't wait to follow your build. And thanks for letting me have another walk down memory lane. And D, thanks for the those two links. The one for Peggy Sue was really special. Kit Form Services do this in cab detail set for trucks which includes a resin guitar which may help. Oh and this car is going to look cool when your done. If you can hang on until Saturday Andy will be posting up a car photo report from a show I attended last weekend and it includes a couple of junkyard/workshop cars. As much as I'm a fan of The Crickets, I think I'll give the old kit a miss. It's great to have you along for what should be a fun build. I'd love to know the full story behind the Peggy Sue logo. I've got to sort out some wheel skirts, so it'll be a while before I need to worry about whether to apply it. That resin set does look neat. Buddy Holly's best-known acoustic was a Gibson J-45 - a dreadnought - so the guitar in the resin set looks a bit small, more like a parlour guitar. This build really does seem a bit like going full circle, because my first figure conversion when I was at high school was to turn Airfix's 54mm 95th Rifleman into Buddy Holly - complete with a scratch-built Stratocaster based on photos. At least, these days I've got a real one to work from if I do decide to add a guitar. I guess we'll really never know for sure the truth about the Peggy Sue skirts, or the car for that matter, as just about everyone involved has passed on. I now really regret not going to see The Crickets when they toured in the UK many years ago (probably late '80s). But, without Buddy up front, it just wasn't somehow the "real deal" for me at the time. Now, of course, I realise how stupid I was, and what an amazing opportunity I missed to see Jerry Allison and Joe B. Mauldin playing. 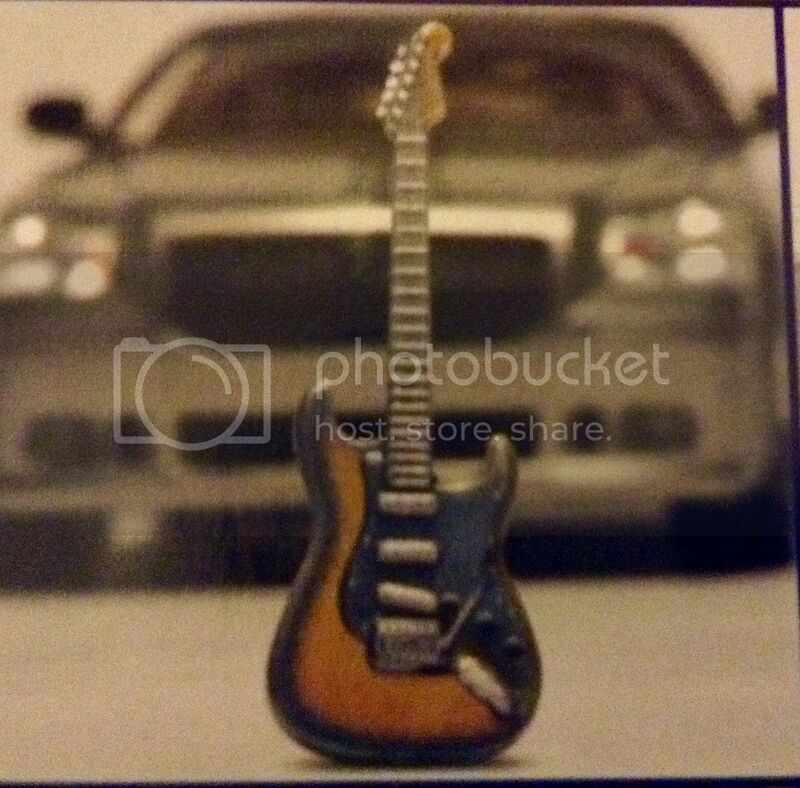 Just found these guitars on Car-Model-Kit.com may be of use? That Strat is really pretty neat! I'll have a go at scratchbuilding one again like I did when I was a teenager just for the fun of it, but it could come in very handy knowing there's a ready-made one to turn to. I might make a start on the Chevy tomorrow, because I'm still messing about with the paint on the MGB. I have managed to polish the Humbrol enamel to a lovely shine, but I think I need to go back a step on the areas where I sanded through the primer. OK - I'm underway! There's not a lot that's exciting to show, so it's really more a case of proving that I've released the parking brake and engaged first gear. A word of caution: Handle bleach with care! Read the safety instructions on the container and follow them. I rinsed the parts thoroughly in water and they look ready to work on as though they'd never been chromed. I presume the styrene was originally the same white as the rest of the kit, but it's now stained a fetching cream colour. Whether that's from the original chroming process or the bleach I used (which was tinted yellow) I don't know. So, onwards and downwards! I'll clean up the de-chromed parts tomorrow morning before work - and then it'll be time to concoct something approaching Chevy's Engine Orange - not a colour that's standard among my aircraft-biased paints line-up. Well a start is a start, totally agree with you on the chrome and the cream colour of the base plastic under the chrome seems to be the norm. Back on the subject of guitars a resent car (Dodge Magnum SRT8) purchase included a guitar, no idea why but it is there. Let me know if it’s of any use and I’ll send it to you. Great to see some progress, on this beauty. Love the "scooped out" valve covers, of the 348 and 409 engines. Great to see this one hit the bench Rowan! I'm sure that this will be a very entertaining build log with the cool old car and the excellent back-story. From what I understand of the process, the kit parts are primed with a high-gloss clear(ish) coating prior to the chroming, which is not easily removed, and this is what you are probably seeing on your parts as a yellowish film. Basically orange with a couple of drops of red or red-brown to darken it up. Model Master have a Chevy Engine Red and a Chrysler Engine Red in their range, but not the Orange. HERE is a great article to help "untangle" the Chevy engine colour conundrum. Here's a good engine bay pic of the 348 cu/in in a 58 Impala. At least it makes a nice change from all the RLM 02 and 66 that I've been using lately! That color is killing it, Rowan. Agreed, you nailed it! A light pinwash of oily grimy goodness and that will look perfect! I need to work on reviews for Aeroscale tomorrow, but I hope to get a bit more done on the Chevy too.